October is Breast Cancer Awareness month; while no food or diet can prevent you from getting breast cancer, research has shown that eating a healthy diet and getting regular exercise can help reduce your chances for getting cancer and many other non-communicable diseases. Make sure to practice a healthy lifestyle each day. Fill up on fiber: Eat plenty of fruits and vegetables; strive for more than 5 cups per day. Watch your alcohol intake. A glass of red wine or beer occasionally may actually benefit your health. Eat foods high in omega-3 fatty acids such as fish, walnuts and flaxseed. Avoid trans fats, processed meats, and charred or smoked foods. Keep your body weight in a healthy range for your height and frame. Exercise for at least 30 minutes, five times a week. If you are at or above the age of 40, be sure to have a mammogram one time per year and breast self-exam monthly. Prevention is the best medicine! A healthy weight also significantly contributes to health status. Seek a Registered Dietitian for a nutrition screening and assessment if you are at risk. For more information on cancer prevention and to learn about raising awareness, contact the American Cancer Society. Kale, grains and toasted walnuts are the base for this healthy bowl. Toss with a chipotle lime vinaigrette and top with salmon, avocado, beans, peppers and cilantro. Cook salmon on a well-oiled grill over medium-high heat for 3 to 4 minutes on each side. Remove from grill and remove skin. Let cool, then cut into 1/2 inch pieces. 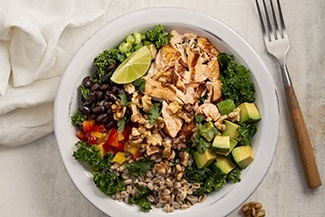 Place equal amounts of walnuts, salmon, black beans, bell pepper, avocado and green onion on the other side of the bowl. Garnish with cilantro and additional walnuts for garnish.